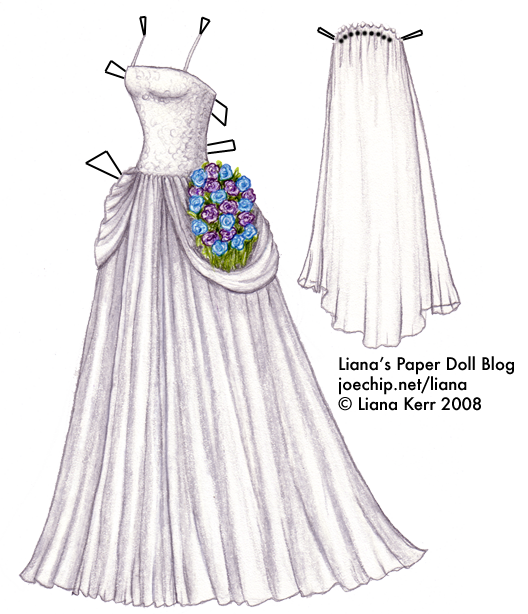 Here’s the 2011 January birthday dress! I had thought about not doing them this year, actually, but then I had an idea for a March one that seemed like it would turn out beautifully, and now I think I will take another shot at completing a set this year. Now that January is finished, all I will have to do is one for February and I’ll be all caught up for at least a whole week! I’ve got a good feeling about this year. This year may bring a dress for every month, including poor neglected April, July and August (thanks Liz!). For those of you with January birthdays, I am sorry this one is late; speaking of which, I’m sorry that today’s dress is late in general. Well, Sunday isn’t too bad — and for those of you for whom it is already Monday, well, I throw myself on your mercy. I’ve been thinking a lot about weddings lately — specifically Japanese imperial weddings, but weddings all the same. 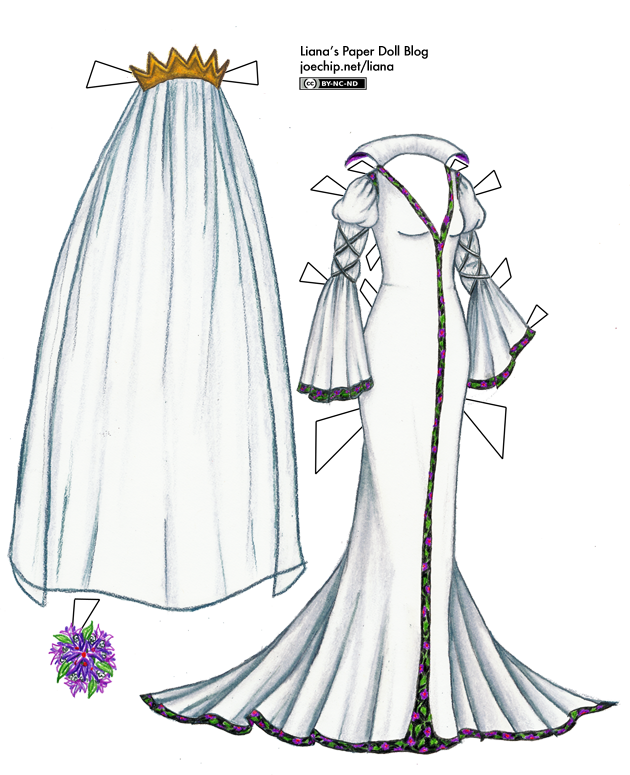 It seems like everyone (in America, that is: the sort of thing one wears for an imperial wedding ceremony is rather different) is wearing strapless gowns with A-line skirts in recent years, and I thought it might be fun to take a stab at one myself. Plus, it afforded more opportunities to play with the white gel pen! I have no idea if blue and light yellow is a popular color combination these days, I just wanted to use some unexpected colors. The fascinator is based on one created by Brian’s cousin Emily. As for the choice of strapless-A-line itself, it’s been popular so long that I’m a little bored of it, but it’s still quite pretty and it has the further advantage of not being a pick-up skirt. By the way, I’m taking a cue from the new paperdoll blog A Paper Closet and showing the outfit on the doll instead of just having it floating on an invisible mannequin. 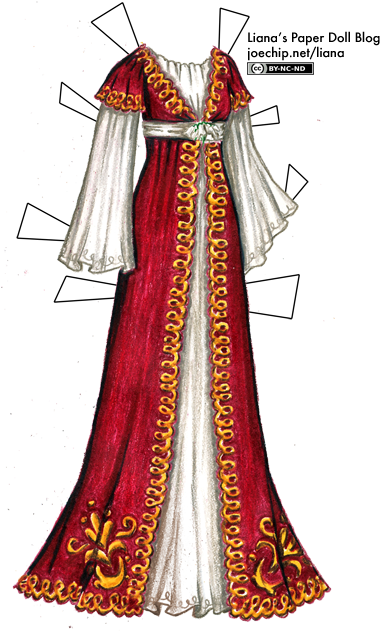 Check that blog out, by the way, and all of the other paper doll blogs I’ve put up on my blogroll, after losing all my links in a server move. There have been some great ones that started while I was on hiatus, like A Paper Doll Blog and Karen’s Paper Dolls. How many visits did my site get between (and including) April 1, 2010 and April 30, 2010? 2) One guess per person per post. 3) If no one gets the exact number by 9:00 PM EST, June 2nd, I’ll pick the closest guess. – Yesterday’s hint: The middle digit is 6. – Today’s hint: The fourth digit (counting from the right) is an odd number. Since my 1940s wedding dress attached to a rant on For Better or For Worse is one of the more popular dresses on the blog, I feel like I should bring the saga to a close. 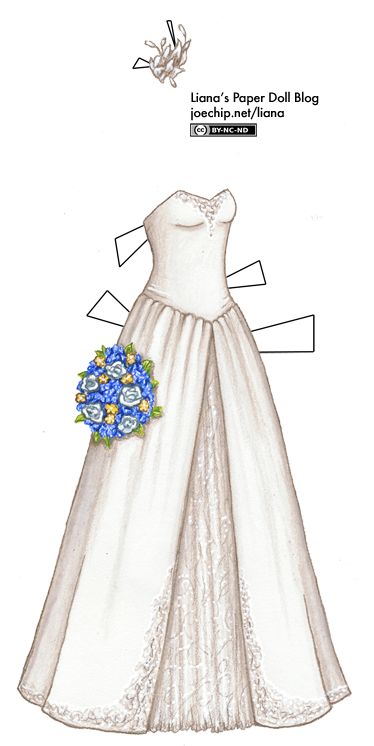 Dee ended up altering the supposedly sixty-something-year old dress into something reasonably modern, the Ghost of Grandma made up for fanciful logic on the part of the cartoonist, the flowers were hideous and Liz ended up marrying that creep. All the way up until the vows were said I was hoping Liz would come to her senses, but immediately after that scene I was so over the whole thing, as evidenced by my putting off the dress for four months. If the end of the saga was boring its weird rebirth is mind-numbingly dreary, although sometimes I visit the Foobiverse!’s Journal out of nostalgia and their second-hand psychoanalysis of Lynn is amusing at times. I still follow Foob’s Paradise, though, which is a webcomic that continues the Pattersons’ adult lives. Since I get so many search queries related to weddings, I’m thinking of doing some sort of “wedding week” perhaps, maybe after Christmas. If you have any pictures of wedding dresses you just love, feel free to post links in the comments so I can get inspired! The Good Queen is so far holding her own over the other dead queen and the rest of her competitors. She would say that’s only the way things should be, but it’s not over yet. I will do a bonus costume or two for whoever wins, so if you adore one of them get your vote in, send your friends over, post to your weblog and beg your readers to vote for your favorite!